HomeWeb DevelopmentWhy is Web Application Development a Challenging Task For Every Business? Why is Web Application Development a Challenging Task For Every Business? The user experience challenge: In the times where thousands of applications are running, it is easy for users to switch to another when your application does not meet their expectations. Therefore businesses can’t afford to sell anything but a great experience. Obviously, the web app can’t be ugly or non-functional but the navigation is also another part which contributes in preventing the visitors to visit competitor’s site. An intuitive navigation where visitors can find any information without pain actually creates a better experience for the users. The speed challenge: The biggest web app development challenge that businesses are facing today is to keep their web page load time under a second. It is said that the span of human attention is declining where it is found that 40% people don’t wait for a web page to load for more than 3 seconds. Imagine just 3 seconds! Businesses at times just focus on the aesthetics of the website while forget to concentrate on its performance. Customers abscond the slow web applications thus damaging the revenue and reputation. Therefore, page load time is extremely important for end users to have a great experience. The Security challenge: In the midst of design and performance, web app security is often ignored. It has become an immensely difficult task for businesses to constantly maintain the security with the everyday evolving threats. Security has to be maintained throughout the software development lifecycle, especially in the areas of the payment details, confidential data or contact details. Some of the security threats are Shell Injection, Cross-Site Scripting, Buffer Overflow, SQL Injection etc. The businesses should proactively monitor the network traffic to pick any strange behavior and should know all possible attack vectors of the system. The multi-platform challenge: In the times of smart devices like smartphones, tablets, laptops etc, it is absolutely essential for businesses to take account of all devices on which the new web application can be used. The screen sizes, cross-browser compatibility, ratios and pixel density of different devices should be all carefully thought before developing new applications. 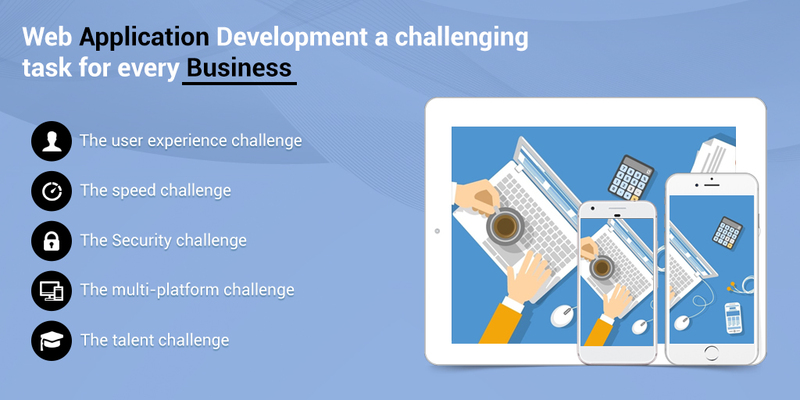 The talent challenge: Where the web application market is over saturated and its development is becoming faster and complex, the challenge with businesses is to find such developers who have the complete skill-set to design the app which is efficient enough to generate higher revenues. Web application definitely takes more engineering than websites and therefore businesses should hire senior talent with good oversight so that they can really deliver value for money services. Thus with all the major challenges stated above, we are sure it would be easy for businesses now to start preparing for their web presence, wherein they can easily achieve a technically sound, visually great and a user-friendly final product.